Let’s start with the bad news: You and your employees are not your business’s best salespeople. You’re not even a close second. That’s not an insult. It’s simply the truth. And the proof is in the numbers. Ninety-two per cent of global consumers say they weigh earned media sources, like word-of-mouth marketing and recommendations from friends and family, above “all other forms of advertising.” What’s more, not only do a full 90 per cent of today’s consumers read online reviews, 88 per cent of them trust those online reviews as much as personal recommendations. What does all that mean? It means the people your audience already trusts are far better at selling you than you are. Of course, there’s nothing particularly surprising about that insight. People have always trusted outside sources—whether they have a personal relationship with them or not—more than they trust advertisers and salespeople. What is surprising, however, is the near revolution this well-worn insight has sparked since 2013, called influencer marketing. That’s a bit heady. So let’s simplify: Influencer marketing is building genuine relationships with the people your market already trusts and influencing them to say nice things about your business so you don’t have to. Those nice things can run the marketing gamut, from endorsements to recommendations, reviews to mentions, social shares to and backlinks to assist with your website traffic or search engine optimization efforts. Why should you invest in influencers? Because not only does AdWeek call it “the next big thing,” but, over the last year, businesses that have invested in influencer marketing saw a $6.50 ROI for every dollar spent. Building an influencer marketing program is easier when you have the budgets of a big brand, but even if you don’t, this five-part guide will help put you on your way to a successful influencer program. As with anything in online business, you need to start by setting goals. Not just any kind of goals—the right goals. For influencer marketing, this means bringing together qualitative goals as they apply to the relationships you're developing and quantitative goals as they apply to bottom-line results. When it comes to influencer marketing, the crux of the matter comes down to qualitative goals, but you have to establish clear quantitative goals to match. The best way to do this is by segmenting your quantitative goals into three categories: social media, link building, and sales. Do you want more social shares, Facebook fans, Twitter followers, or LinkedIn connections? Are you aiming at increasing positive brand mentions, social-media traffic, or influential retweets and likes? How many new links do you want? 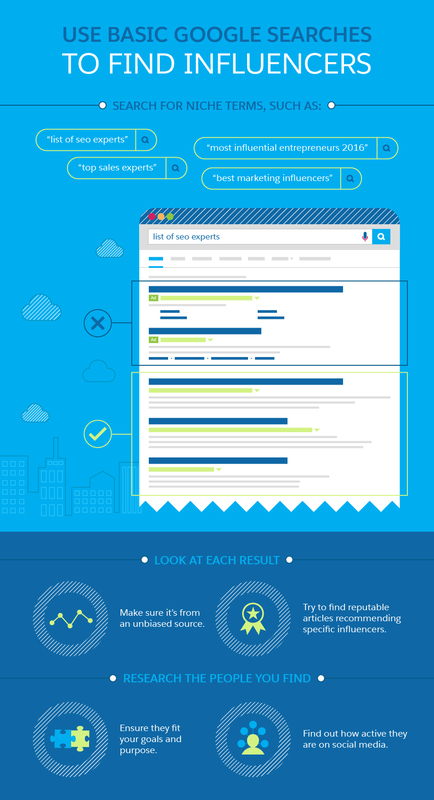 How powerful should those linking sites be (i.e., domain authority)? What’s your deadline to make it happen? Do you want more recommendations for your product or service? Are you trying to generate a specific number of reviews? Ultimately, how many new sales would it take to justify investing in influencers outreach? By answering these kinds of questions, you can aim for real numbers and not mere guesses. However, be warned: Influencer marketing is notoriously difficult to measure. This is true not only because it’s deeply relational, but also because it takes place across a host of different platforms and mediums, most notably email, backlinking, and social. Be sure you have the right tools in place to track your social network-specific goals—mentions, likes, clicks, followers, and reach—alongside your non-network specific goals like raising your Klout score (i.e., your cumulative social influence) as well as off-social goals like building up your backlinks and keyword ranking. Bringing all of these metrics together in one place, rather than bouncing between several different dashboards, can simplify tracking your influencer progress. Once your goals are in place, it’s time to create a list of influencers in your niche who can help you achieve them. A Google search is often enough to find good targets, especially if your niche is a popular one. 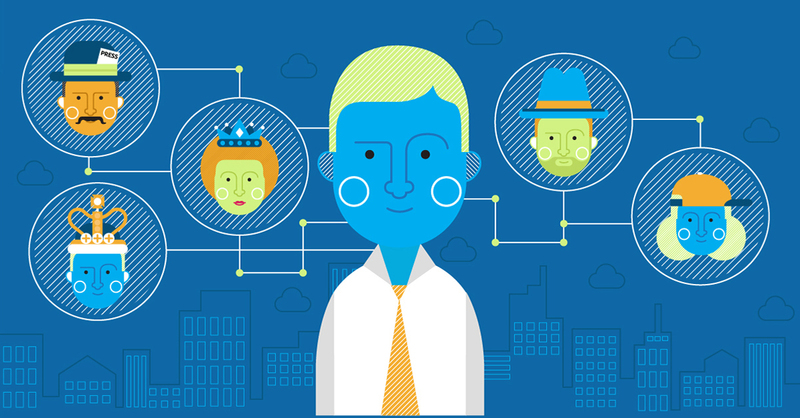 A smarter way to identify influencers is through tools like Klout, FollowerWonk, or BuzzSumo. Using Buzzsumo, you can create a free account, select “Influencers” in the top navigation, and search for a handful of your niche’s key terms. With a paid Buzzsumo account you can then export that list. Alternatively, you can create your own influencer marketing spreadsheet. Whichever tool you use, the point is to get a robust list of possible influencers to start connecting with, but that doesn’t mean all of them should make the cut. When it comes to influencer marketing, quality trumps quantity. In the massive, helpful article “Become a Super Connector: How to Work With 1,000+ Influencers,” Jason Quey suggests two questions you should ask yourself before choosing who to reach out to. 1. Is the influencer’s audience relevant for what I’m offering? If the influencer’s audience won’t benefit from you or your content, he or she may not make a good target. After all, their audience is what matters. It’s also helpful to identify the type of influencer you want to work with. 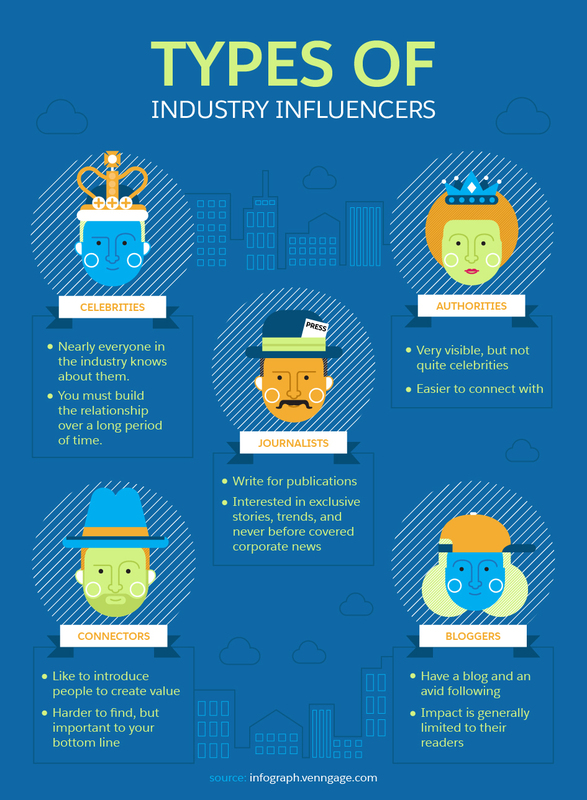 This means understanding the five types of influencers is key to targeting the right people: celebrities, authorities, journalists, connectors, and bloggers. 2. What’s the influencer’s reach? You don’t necessarily need to base your selection entirely on reach or the raw number of each influencer’s follower count. If one of your goals is to get more backlinks or sales, reach doesn’t matter that much. However, if your goal is to drive more traffic, then reach becomes a key qualifier. How do you measure reach? Again, you can use tools like Buzzsumo, Klout, or FollowerWonk: The higher the influencer’s score is on those platforms, the better their reach. Just be careful and confirm the results by analyzing their audience engagement, such as their own post’s likes, shares, retweets, or re-pins. Pay special attention to your influencers’ follower-versus-engagement rates. Targeting the right influencers isn’t about landing the biggest fish in terms of raw followers. Instead, it’s better to prioritize influencers with low follower numbers but high rates on metrics like retweets, likes, and shares. Influencer marketing rookies are notorious for skipping this step. Instead of adding value to their influencers, uninitiated marketers create a list of influencers who seem like good targets and immediately start firing off pitches. In other words, they contact strangers, rather than friends, and they try to take before they give. Remember: The key to your influencer marketing success is to establish genuine relationships. Coming on too strong is a big mistake. If you really want to stand out, you need to take a subtler approach. First, pay attention and “listen” to what your influencers are saying. Follow them on social media, read their blogs, sign up for their email newsletters, download their popular guides, and spend time on their YouTube channels. In other words: learn everything you can about them. What kind of content do they share on social media? Who do they themselves follow and admire? What causes do they care about? Do they have a personal site in addition to their business or brand website? Start by taking a genuine interest in your influencers, and the genuineness of your relationship improves exponentially. You can also learn a lot by tracking what social media users and other publishing outlets are saying about your influencers. Tools like Mention and Google Alerts are invaluable because you can set up automatic notifications every time a new post, article, news item, or mention of your influencers goes online. This is a good way to “intercept” relevant conversations. Second, you need to make sure influencers become familiar with your name. You can start by commenting on their blogs; joining the subgroups they’re part of (especially on LinkedIn); following the company they work for; upvoting their links on Reddit, Inbound.org, ProductHunt, or GrowthHackers; and even adding to their threads on Quora. Be personable. Don’t just share their content: Tag them and add your personal observations. Sign up for their email list and write back, even if it’s an autoresponder. Lastly, while this point has already been mentioned, it absolutely bears repeating: Do not ask for something right away. 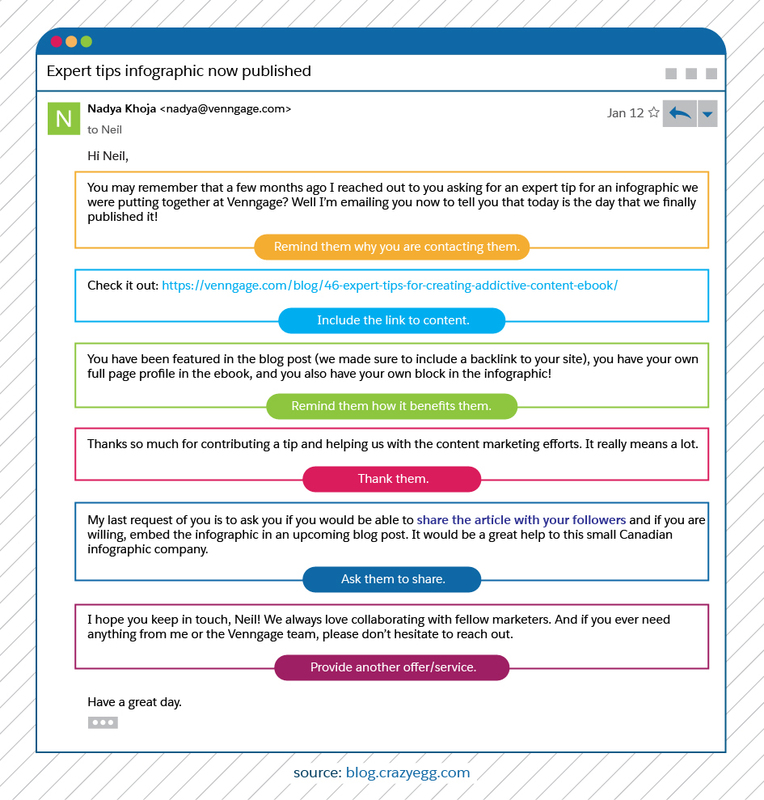 Make sure you have somewhere between 10 and 20 personal contact points—blog comments, social shares, or email exchanges—before you start making requests. You know your influencers’ interests. They themselves are familiar with your name. Remember: You’re contacting incredibly busy people. Keep your communication short and to the point, and avoid unnecessary information. This shows influencers you respect their time, and you can be sure they’ll appreciate that. As human beings, we’re reciprocal. If the people you’re reaching out to see you’re willing to do something for them, they will be more likely to return the favor. That’s why researching your targets is vital. On the benefits front, Sujan Patel recommends a handful of non-traditional ways to add value during your outreach. This includes offers like sharing proprietary data, complimentary resources, unique expertise, and even offering to contribute. Beyond what you can offer, ask yourself: Why would this person want to promote my content? Yes, you’re proud of your post. But is it something that makes the influencer a better contributor? You can’t just look for relationships that benefit you. Each one needs to be symbiotic. Influencers often get outreach emails that read like press releases—because that’s exactly what they are. Don’t try to sound smart, self-important, or salesy. Avoid jargon, buzzwords, and clever phrases (especially words like “synergy”). Instead, use a friendly style and conversational tone. Make sure to always specify what you’re asking for. If you want a backlink, ask for a backlink; if you want social shares, ask for social shares; if you want a review, ask for a review; if you want to write a guest post for them, ask to guest post. Do not obscure what you want from an influencer by beating around the bush. After all, if they can’t understand exactly what you want, they won’t do anything. After following Barez-Brown, as well as his company Upping Your Elvis, I shared a few of their posts. When I found an opportunity to work with him, I let him know why I was excited to connect with him specifically. I wrote like a real human, and only after a few exchanges did I eventually go for the ask—an interview for an upcoming article. 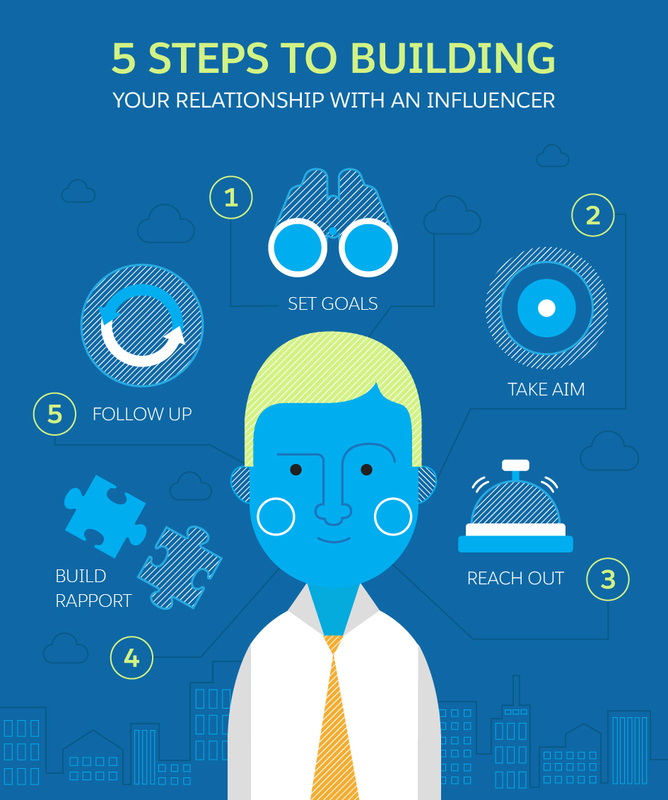 In spite of all the work you may put in, even with all these steps, not all of your influencers will respond. Don’t let that disappoint you: It’s completely expected. That’s why you need to follow up. Some influencers missed your message, and some of them forgot to answer. A quick, respectful reminder won’t hurt. Wait a couple days and send a reminder. If they don’t respond, send a brief email to tell them you want to make sure they received your message. Some influencers just don’t respond via email, so you need to try other platforms. Twitter is an effective way to make sure your influencers receive your message. A simple, tagged Tweet is a great way to stay warm after you’ve sent them an email. Although following through with influencers is a recommended practice, make sure you aren’t too pushy. Influencers are busy and sometimes just not interested in your proposal. In that case, continue building the relationship or move on to the next influencer on your list. You and your employees are not your business’ best salespeople. The people your prospects and customers trust are. For all its profound benefits and complexity, influencer marketing comes down to a simple idea: building genuine relationships with the people your market already believes and getting them to say nice things about you. Taking a systematic approach by following these five steps will help immensely. Just remember: Never skimp on the human element.